1) I associate Valentine’s Day more with candy and the colors pink and red than love. 3) Maybe I lied about “secretly” chuckling since I just told the World Wide Webular. 4) I like red roses. Many women like to say they don’t, but when they get them, I think they secretly like them. No more secrets, please. 5) Why is there an unspoken rule that it’s sorta the man’s responsibility to plan unless otherwise noted? 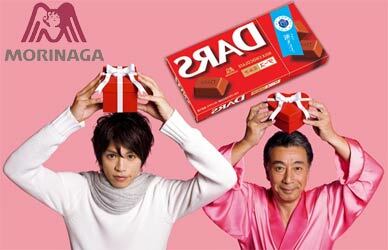 In Japan, women give gifts on February 14th, and men reciprocate on March 14th. Consumerism at its most equal. 6) It’s on a Monday this year. That can make office dynamics really fun to watch. I wish I didn’t work alone. 7) One Valentine’s Day I was working at a company that was 90% females. My boyfriend and I had just broken up the week before, but, as I said in point uno, Valentine’s Day is more about candy and pink than love. I was excited and dressed up in all pink and took heart-shaped cookies to work. If I recall correctly, most employees were wearing black and cold stares. 10) Sometimes simply numbering things is no longer enjoyable for me. Or stopping at ten. 11) There was one Valentine’s Day that caused me a lot of agony. Second grade, Mr. Berry’s class. It was my first year in “real” school after having been homeschooled with other really cool homeschoolers. Mr. B. instructed us to have valentines to give each classmate. I can vividly remember being in my parents’ basement the night before in agony over which valentine to give Ryan Hosler. I wanted one that wouldn’t give away the fact that I was in love with him, but wasn’t too casual and said “You are neat.” It was a fine line. Ryan: I don’t remember which one I picked for you (feel free to let me know if you have it framed somewhere in your room), but I figured now, on Valentine’s Day 2011, I can tell you that I had romantic feelings for you as a seven year old. You ruined my Valentine’s Day 1990 due to my stomach being in knots. But it’s OK, because it was all done in the name of love. * No, this is not a disease. It stands for “What Would St. Valentine Do?” If you forget to plan anything for your special Snookleberry pie or the plans just fall apart, you can say to your Pookie, “W.W.S.V.D?” Then you both would remember that he was beheaded for trying to tell people about the love of Jesus and that would make missing your dinner reservations not seem so bad. ** Inserted for humor’s sake. I am not bitter, nor do I cry…very often. For years my favorite part about Valentine’s Day was the shoe-box/mailbox making contest (You know, to hold all your classmates’ Valentines?). I would SLAVE. And the result was AWESOME. Oh my stars. You are hilarious! girl you gotta write a book, and do a DVD, it would be like Jon Acuff, but not because it would be by you. And it would be hilarious. And I would buy it. For reals. I think you’re swell. Ryan definitely missed out when he didn’t pledge his eternal love to you in 2nd grade. When I see people who post crap that says “I hate Valentine’s Day” and stuff, I like to turn to my imaginary friend and say “Well, look what the cat dragged in, Margaret!” Then I point and laugh. For 20 minutes or so. Maybe longer. Val – I can’t picture you going glitter happy to perfection on something like that. Oh wait, yes I can. Jenny – You think too highly of me. (-: Although the Jon Acuff comparison could make anyone’s day. Thank you! Sheryl – Seriously. What was he thinking. I do know that he used to call me “Joy the Boy” behind my back in middle school. That probably means something. Renea – For awhile I couldn’t tell if she was a “she” or not. That picture is incredible. David – God gave you the gift of encouragement didn’t he? That and “cat whisperer.” It’s a gift, check out the end of Revelation or something. 1) I also homeschooled until 2nd grade! Homeschoolers unite! B) Do you really get the vibe still that people assume the man has to take responsibility for Valentine’s Day plans and gifts? It really seems to me in the last few years that most couples I know, young or not as young, equally participate in whatever they do or give to celebrate Valentine’s Day. Some commercials are behind on this, but in practice, I see things playing out more equally. Corinne – I totally think women participate. What I sense is a difference (and I could be wrong) is the level of expectation for men and women. I think more often women ask each other, “What did he do for you for V-Day?” If a guy forgets or does something less than what she did, I think girls are more apt to start questioning if he really cares about her. I guess I just don’t see that happening with guys as much. I hope romantic expectations are starting to equal out like you said! I see what you mean. But in general it doesn’t seem like guys tend to ask each other those types of related questions like “So what did she do for your birthday?”… girls tend to ask more, be more interested. I do agree that girls would be more likely to question his feelings if he did nothing rather than guys questioning a girl’s feelings if she did nothing, but the same seems to go for other types of occasions as well between couples as well, like anniversaries and birthdays… at least it seems to me. This list is fantastic. And I love it. And you, really. Thanks for adding some humor to the holiday. Also, I loved the way you numbered your list. i outed all females on the getting flowers thing on my blog. we say we don’t like them, but we do when we get to flaunt them in front of the poor unfortunate souls who didn’t get flowers. we’re all terrible people on the inside. i’m stealing your idea and posting a top 10 of v-day from RAFS. Corinne – Totally agree with you. I think women do tend to do that more. Where a problem can occur is when women believe they “care more” than men because they inquire more or show it ways they deem as romantic. Haley – How many ways have you counted so far? I’m waiting to get a final number. RK – I don’t even want to imagine how many rose pricks you got on Valentines day. I bet your final bouquets were blood stained. That’s a deep metaphor. i love the way you “numbered” this list. ha. Last year, I actually gave my hubby a “free pass”. You know, “don’t get me anything…no card, flowers, candy… NADA.” It made the day much more enjoyable not expecting anything. I had a great day – b/c I DO love V-Day – and enjoyed doing special stuff for him and others just b/c I wanted to. NOT b/c I felt I had to in order to keep up with some invisible tally. It spilled over into this year, too, but he said he didn’t want a “free pass” again. I was kind of floored. I still said not to worry about it. STrangely, I meant it! It is sooo much for fun when you can give and not having strings attached. Ya know? i copied your number system. i’m a joy wanna be.